Inspiration: We wanted to create an app to support environmental sustainability by building a personal environment that shows the direct impact of climate change. We hope that bringing the effects of global warming right in front of your eyes will encourage people to be more proactive about sustainability. We also were excited to try out the new VR gear and the different platforms that support it. What it does: Our app puts the user in the center of an environment being immediately impacted by climate change. 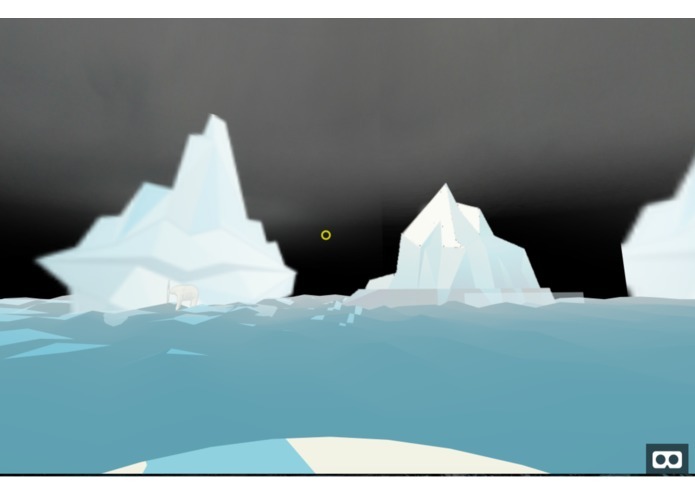 It shows icebergs literally melting around them. It will also incorporate data from the worldbank climate data api and show real correlations between the changing annual temperature and the amount of shrinkage occurring around them. Challenges we ran into: We are brand new to using A-Frame and had to figure out how to animate our components and manipulate them using real physics. What's next for The Final Meltdown: We want to apply the data we pulled from the climate api. We plan on having a slide scale or dial so the user can move forward and backward in time to see how it affects the icebergs around them. We also would like to have a bear-shaped bear instead of a cube-shaped bear. Even further plans include having buttons with various activities to reduce climate change (such as turning off your lights or recycling) that a user can click to try to slow down the effects of the melting icebergs.